VANCOUVER, April 16, 2019 /CNW/ – IsoEnergy Ltd. (“IsoEnergy” or the “Company“) (TSXV: ISO; OTCQX: ISENF) is pleased to announce assay results for the last drill holes from the winter 2019 drilling program. 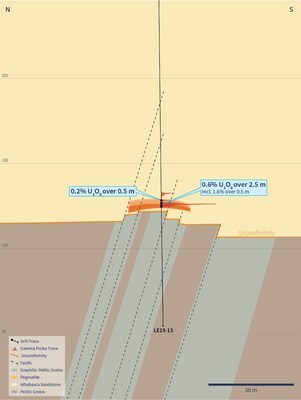 Drill hole LE19-12 was collared 75m to the west of the discovery section and intersected 8.5m of 3.2% U3O8, 2.1% Ni and 0.2% Co, including 1.0m of 14.3% U3O8 and 1.1% Ni. 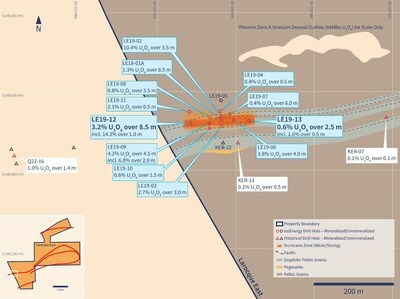 The final drill hole of the program, LE19-13, was collared 75m east of the discovery section and intersected 2.5m of 0.6% U3O8, 0.2% Ni and 0.5% Co, including 0.5m of 1.6% U3O8, 0.4% Ni and 1.1% Co. 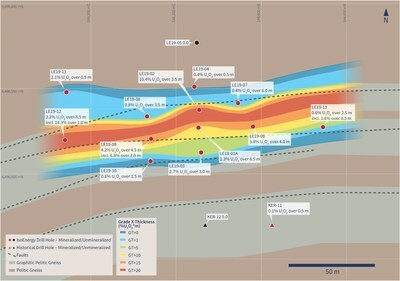 The Hurricane zone is a new discovery of shallow (330m below surface), high-grade uranium mineralization on the Company’s 100% owned Larocque East property (the “Property”) in the eastern Athabasca Basin of northern Saskatchewan (Figure 1). The Company recently completed the first follow-up drilling program after the discovery intersection in July 2018. Eleven of the twelve drill holes in the follow-up winter campaign intersected significant uranium mineralization. Hurricane now measures 150m (long) x 38m (wide) x up to 8.5m thick. The zone is open on all five sections drilled to date and along strike in both directions. The Company, having raised $5.5 million in December 2018, remains fully funded for a follow-up drilling campaign that is planned for the summer. Larocque East consists of 6 mineral claims totaling 3,200 hectares and was purchased in May, 2018. The Property is owned 100% by IsoEnergy and is not encumbered by any royalties or other interests. Larocque East is immediately adjacent to the north end of IsoEnergy’s Geiger property and is 35 kilometres northwest of Orano Canada’s McClean Lake uranium mine and mill. The Property covers a 15-kilometre-long northeast extension of the Larocque Lake conductor system; a trend of graphitic metasedimentary basement rocks that is associated with significant uranium mineralization at the Hurricane zone, and in several occurrences on a neighbouring property to the southwest of Larocque East. The closest of these to Larocque East are the Larocque Lake and Larocque North zones, which are located 6.5 kilometres and 0.4 kilometres, respectively, to the southwest of the western Larocque East property boundary. 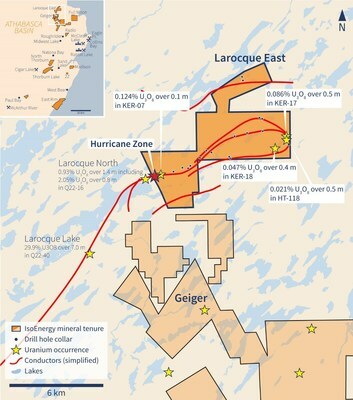 Drilling at the Larocque Lake zone has returned historical intersections of up to 29.9% U3O8 over 7.0 metres in drill hole Q22-040. 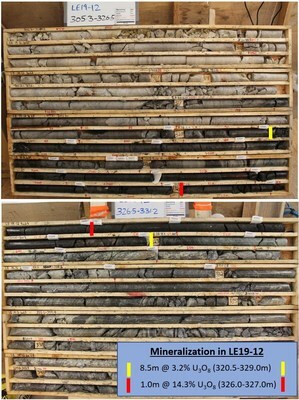 Drilling at the Larocque North zone has returned intersections of up to 2.05% U3O8 over 0.6 metres in drill hole Q22-16. Like the nearby Geiger property, Larocque East is located adjacent to the Wollaston-Mudjatik transition zone – a major crustal suture related to most of the major uranium deposits in the eastern Athabasca Basin. Importantly, the sandstone cover on Larocque East is thin, ranging between 140 metres and 330 metres in previous drilling. The scientific and technical information contained in this news release was prepared by Andy Carmichael, P.Geo., IsoEnergy’s Senior Geologist, who is a “qualified person” (as defined in National Instrument 43-101 â Standards of Disclosure for Mineral Projects). Mr. Carmichael has verified the data disclosed. This news release refers to properties other than those in which the Company has an interest. Mineralization on those other properties is not necessarily indicative of mineralization on the Company’s properties. An RS-125 hand-held spectrometer was used to verify that the radioactivity is due to uranium. 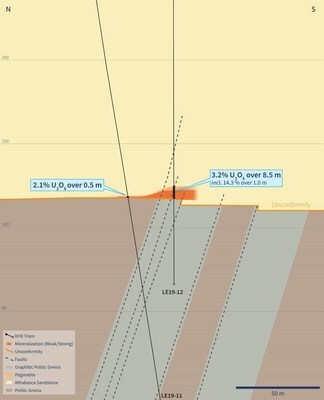 As the drill holes reported herein are vertical or near-vertical, and the mineralization is interpreted to be horizontal, the true thickness is expected to be within 90% of the cored intervals. This news release shall not constitute an offer to sell or a solicitation of any offer to buy any securities, nor shall there be any sale of any securities in any jurisdiction in which such offer, solicitation or sale would be unlawful. The securities referenced herein have not been, nor will they be, registered under the United States Securities Act of 1933, as amended (the “U.S. Securities Act“), and such securities may not be offered or sold within the United States absent registration under the U.S. Securities Act or an applicable exemption from the registration requirements thereunder.